Parents, have you ever had your precious bundle of joy just not want to fall asleep? Well, you are not alone. 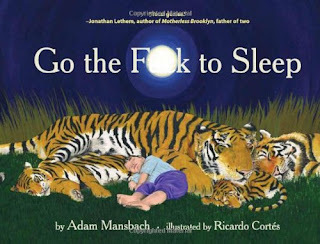 This picture book is finally here for you. 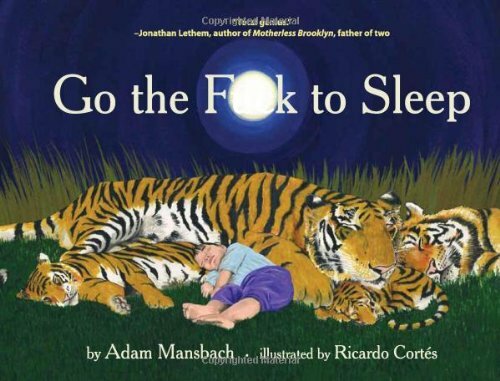 It puts a sarcastic tone to a frustrating activity that happens almost every night: making your kid fall asleep. This book is really deceiving and fantastic at the same time. It has a children’s book feel to it but with a closer look, it is meant for an older audience. With the f-word inscribed behind a picture of a moon, it is truly something that is unique to all readers. It is one of the most hilarious books I have ever encountered. I barely could enjoy the wonderful illustrations because I was crying from laughing so hard. The writing style is of that you would hear in a children’s picture book; it rhymes and has illustrations that look child-like, pictures of animals and landscapes. It is great that Mansbach had those pictures illustrated and wrote about them as beautifully without losing his style of satire. If you are a parent and haven’t read this yet, go open it up. You are missing the book that will definitely make you laugh until you cry. Rated PG-13 for strong language. Oh my goodness, I saw this show up online--and on our major newspaper's website--a few months ago and laughed till I cried. This sounds AMAZING. I saw it for the first time in realy life a few weeks ago--right before Christmas. I want to read it now! EEEEEEE!